← How big a problem is the UK’s public debt? There are big structural problems in the UK jobs market: low pay, low labour productivity, insecure work for the young, and next to no incentive to earn more for those on tax credits (or indeed Universal Credit). These should all be near the top of our problem list. Falling levels of worklessness needn’t be. Welfare policy – and ministerial rhetoric – are yet to catch up with this. The real problem with UC stems not from this understandable desire to integrate benefits, but from its narrow view of the social problem that benefit integration could be used to fix. At root, UC is a policy shaped by the view that the towering problem facing the UK today is mass worklessness; it has fragments of ‘Broken Britain’ in its DNA. Yet, as RF research showed last week, worklessness among non-disabled couples with children has plummeted over the last fifteen years. As things stand UC will end up being a missed opportunity to make in-roads into one of the real social-ills of our time: in-work poverty and the low pay trap. We see the same theme in comments about cutting the welfare bill. The high cost of social security is still framed as a worklessness problem. 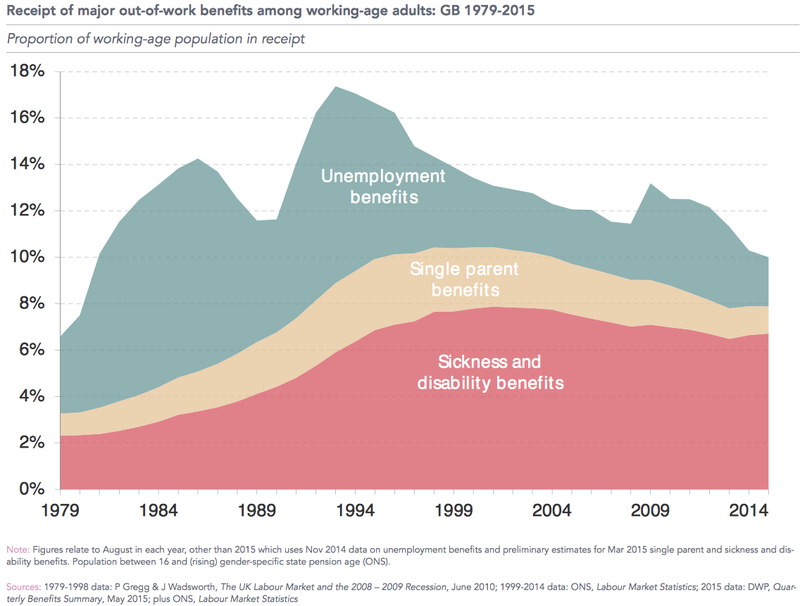 Yet the proportion of people claiming out-of-work benefits has been falling steadily for the last 20 years. The worst recession in living memory caused a slight rise but even this didn’t take it back to its 1990s level. Of those without work, only a minority have been without it for long. Many go through what the Joseph Rowntree Foundation describes as the low-pay no-pay cycle, moving between periods of unemployment and low wage work. This seems to have continued during the downturn. Even the worst recession in living memory didn’t have that much effect on labour force participation. 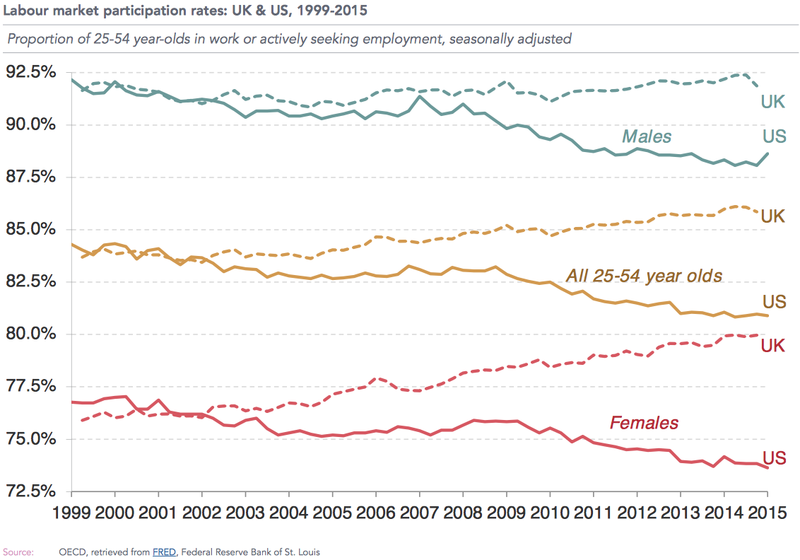 In the UK, most people kept looking for work and employment bounced back reasonably quickly. If ever the British were work-shy, we’re certainly not now. The flip side of this rise in employment, though, has been the rise in in-work poverty. A lot of these jobs don’t pay very much and have to be supported by benefit payments. Alongside the fall in the proportion of people on out of work benefits, there has been a rise in spending on tax credits and housing benefit. In 2012, the number of working families in poverty overtook the number without work. (See previous post.) Among those households below the official poverty line, the working poor now outnumber the unemployed, retired and sick put together. Not only do the in-work poor outnumber the workless, nearly half of them are in families where all the adults have jobs. Despite all this, MPs still talk about the “something for nothing” welfare state and the Conservative Party issues press releases saying that this is why the welfare bill is out of control, reinforced by a poster campaign featuring a man with his feet up. The Prime Minister has just appointed as Employment Minister someone who said that the British are “among the worst idlers in the world“. Like its view of industrial relations, the government’s image of poverty and welfare is stuck in the 1980s. Strikes and powerful unions are, for the most part, long gone but that doesn’t stop Conservative politicians making blood-curdling speeches about the dangers of industrial action. Likewise, the association of poverty with idleness and unemployment shows a lack of understanding about how the nature of work has changed. As the Resolution Foundation’s Adam Corlett said, the debate about work and welfare “sometimes feels like it’s stuck in a time-warp”. Assumptions about the link between poverty and lack of work no longer hold true. These days, those claiming benefits are more likely to be cleaning offices, making sandwiches, picking vegetables and looking after the elderly. 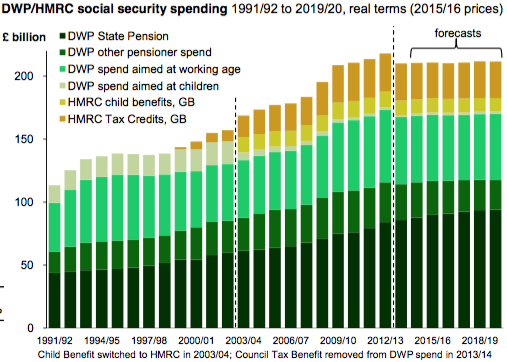 If the UK’s social security costs really are out of control it’s not because lots of people are sitting around with their feet up. It’s because lots of people are in jobs that just don’t pay enough. 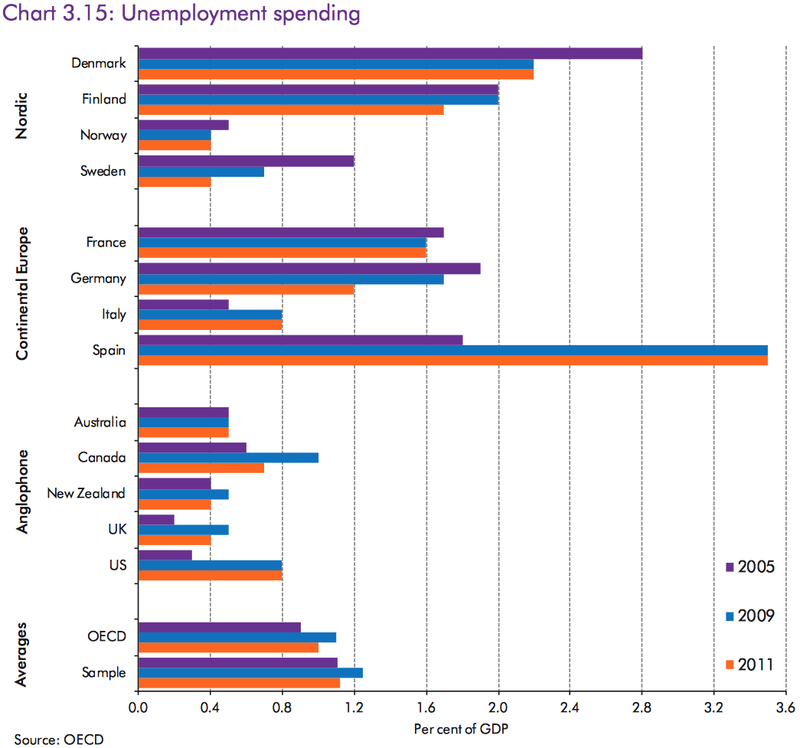 Today’s Welfare Trends report from the Office for Budget Responsibility compares the UK’s benefit spending to that of other European and OECD countries. 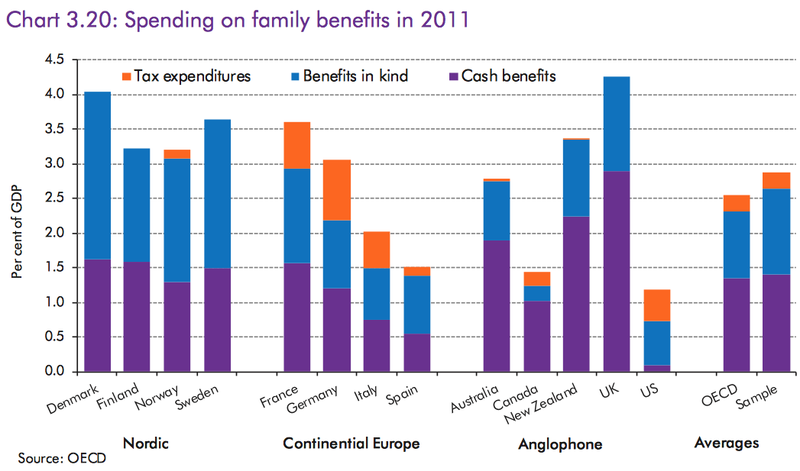 Tax credits are the largest component of spending on families in the UK. Spending on them has doubled as a proportion of national income since 2002-03. 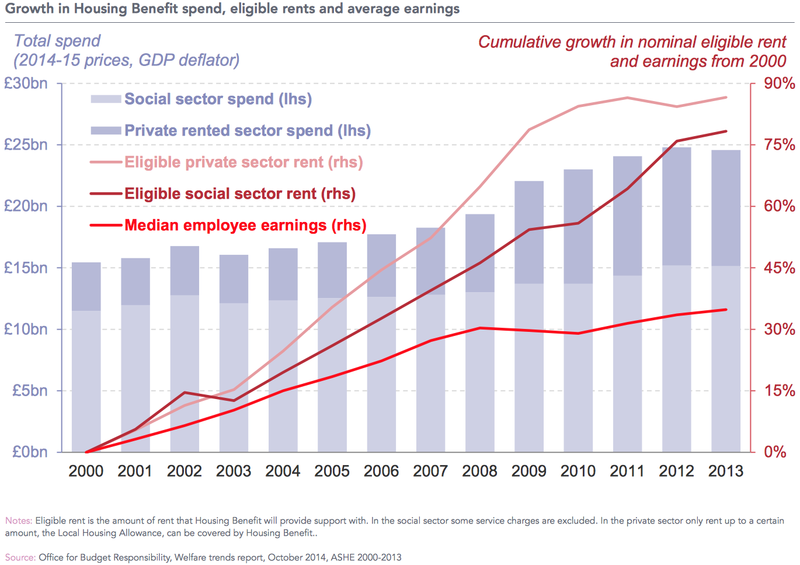 Some of the UK’s relatively high figure is because other countries support housing costs through other benefits, so in some places what we class as housing benefit would come under, say, unemployment benefit. Even so, our spending is way ahead of the average. I’m guessing that rents in London and the South-East must push the figure up. Is there any evidence on whether the effect of in-work benefits is to increase employment (because it is more worth doing a low paid job) or to cut employment costs to employers benefit? Why has there been such a massive increase in sickness and disability benefits. Which massive increase is that? You’ve got around the same number of people claiming now as you had back in 2010, according to the DWP, though they don’t shout about it. Where’s the increase you’re referring to? I mean the increase from 1979 to 2000 shown in the graph. Gotcha now, sorry, thought you meant more recently. In the early days, that was Thatcher dumping people off the unemployment rolls into the sickie roll where they wouldn’t be so embarrassing, a a policy which I suspect has been followed by all governments to this day. Also you have to bear in mind that due to advances in medicine and nutrition people are living longer. I’m not simply referring to an increase in individual longevity, but that people are surviving medical situations that would till quite recently have killed them off. So they’re staying with us, but not as well people, hence the ongoing numbers. On that basis I’d expect the numbers claiming to keep ongoing too, at least till the Baby Boomers have worked their way through the system. Also Zerohours,business like food processing or public services don’t want people with colds or contagious diseases working,since their zerohours doesn’t pay if unfit for work the taxpayer picks up the bill. Thats why we need a Basic Income. It will push lower wages up and the same time remove the complexity of current system. But Tories just dont get it. The left don’t get it either. Basic income is essentially unemployment benefit – which the Tories are making hay about even though little of it is being paid. Because real people in the real world want to see others working for a living. It’s not a basic income we need, it is a basic job available to all that want it paying a living wage. The output from people being paid by the state should be taken by the state and made available to the rest of us – rather than being banked as private profit as it is under the tax credit system. Do you have to be so rude? There are lots of ‘real people in the real world’ who just don’t agree with you. If you can’t respect people who disagree with you, you’re not worth listening to. god save us from this old fashioned basic income myth . Hi – was just wondering if you have read Changing London – a rough guide for the next London Mayor by David Robinson (Founder of Community Links and Chair of Early Action Task Force) and Will Horwitz – some interesting ideas that touch on some of your topics too. If you think you’re underpaid , sell your abilities where they’re more valued . Once again , it’s the market . So simple . But as ever you all wish to change everyone else but yourself . With apologies to Tolstoy….. While that may be true for any individual, it is not in aggregate. In addition, firms do not train. The solution is to offer jobs at a fixed wage (start at living wage) from the state instead of using an unemployed buffer stock. The right needs to stop presenting lack of work as the cause of poverty – when so many people are entrenched in jobs that pay poorly. Just like the Lansdale NHS reforms (which had no electoral mandate) the Smith benefit reforms (which have never had an electoral mandate either) are clearly designed to achieve something other than what they purport. The NHS reforms are all about privatising the NHS in the long run. Perhaps the UC reforms are aimed at a similar target? Entitlement to welfare benefits have been steadily scaled down and the process made harder for people to claim and receive benefit payments. Long term, it seems the intention is to steadily cut back the numbers of claimants in order to return to some sort of myopic “golden” age, predating the establishment of the welfare state. Is this is what underlies Osborne’s proposed new rule of balancing the books year-on-year? I don’t trust the Tories or their backers. I think they want to turn the clock back 100 years to a situation where people largely starved or were reliant on organised charity (as with food banks and shelters for the homeless today) or were forced into work houses on poverty conditions. Whatever they say, the Tories are liars and they are out to remove all compassion and provision of social welfare because they instinctively and ideologically oppose any and all forms of real social welfare. They are already talking about removing family tax credits, which support low income families. They claim this will “force” employers to pay higher wages to their workers. Ludicrous of course but useful cover for them to collude in driving down wage levels across the country and – with that – lower living standrads for everyone not one of the new social elite. Welcome back not just to the last century – but to the one before. 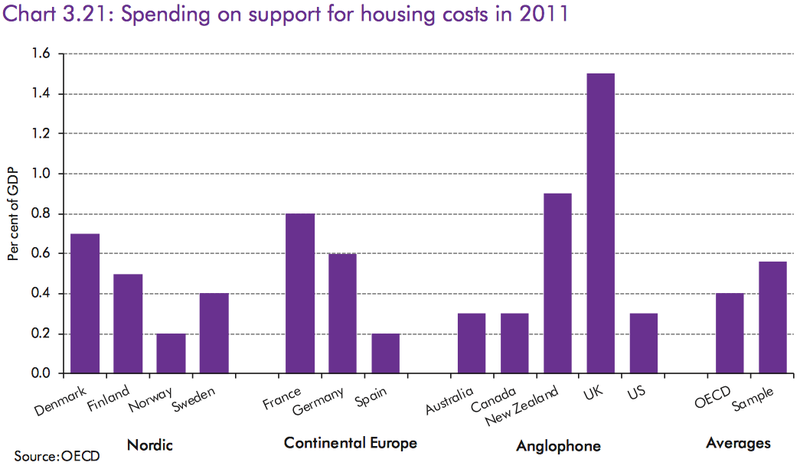 Of course, it’s also worth noting that housing benefits payments don’t really go to the poor. That’s only the rhetorical story. They’re all but a direct transfer from the state to landlords/property owners. This is a really interesting article which provides some in depth analysis about the welfare budget in Britain. It makes the point that Government rhetoric is out of step with the reality. While in work poverty has gone up – workless has gone down. Yet the Government are still keep to characterise the benefits bill as being about lazy individuals and families.